During this tour, which is only possible upon prior reservation, an expert naturalist guide will take you through our private nature reserve and introduce you to its rich biodiversity. During the walk you will learn more about the fauna and flora of the area as your guide will share his knowledge with you and show you all kinds of species from tiny insects and frogs to snakes, birds and if youâ€™re lucky, the peculiar Ocelot. You can enjoy this unforgettable tour in all safety. This walk is a fun and educative option to learn more about the forest and the local environment and enjoy the close contact with nature. The trail makes a loop with a total length of 3100 meters within the mountainous area. 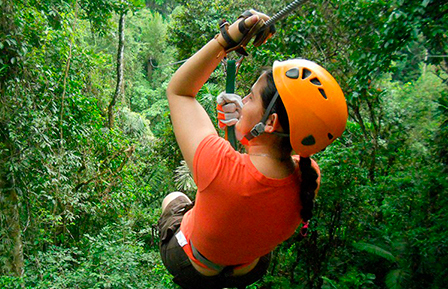 Along these three kilometers of trails you will be immersed in the divers fauna and flora of the rainforest and admire exotic animals, colorful birds and tropical plant species. While you’re walking along the trails, the fascinating world of the tropical forest will open to you. Our goal is to offer you a safe and sustainable way to enjoy the abundant natural resources and at the same time protect it for our future generations.